EOSCpilot/OpenAIRE-DE joint workshop "Future Open Science services for scientific communities"
Home » events » EOSCpilot/OpenAIRE-DE joint workshop "Future Open Science services for scientific communities"
The EOSCpilot project and OpenAIRE Germany are proud to announce their joint workshop "Future Open Science services for scientific communities". 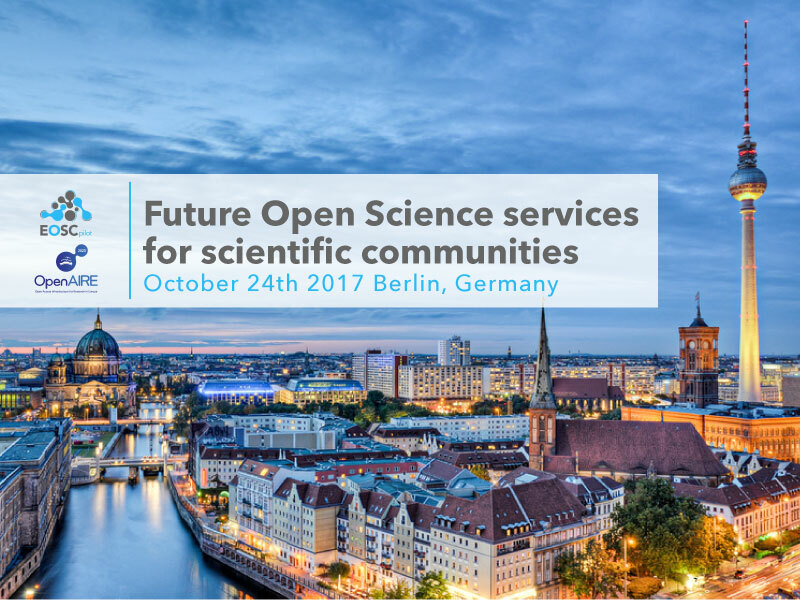 The workshop will take place in Berlin, Germany, on October 24th 2017, the day before the FORCE 11 conference. This free workshop will address researchers from diverse scientific communities, as well as research administrators and libraries, to present the EOSC vision, its first phase of implementation via the EOSCpilot project, and OpenAIRE’s services for Open Science. It will be a forum for dialogue, serving to collect feedback from participants about their expectations for the EOSC, and their views on the challenges and opportunities its implementation will bring and will help both EOSCpilot and OpenAIRE to shape their future developments according to researchers' needs. If you are a researcher whose work could potentially benefit from the EOSC, then this workshop will be an important forum for you to learn more and give your feedback to guide its user-centric development. With a strong emphasis on community and stakeholder building, the second EOSC Stakeholders Forum 2018, organised by the EOSCpilot project, was held at the Austria Center Vienna in Austria on 21-22 November 2018. Held immediately prior to the Official Launch of the European Open Science Cloud (EOSC) on Nov. 23 under the Austrian Presidency of the Council of the European Union, this year’s installment of the forum was timely and the importance of the European science cloud to the European policy agenda was evident.